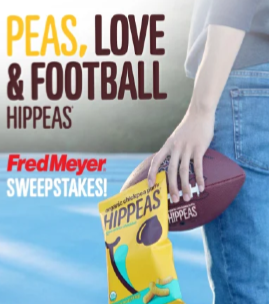 Hippeas x Fred Meyers Peas, Love & Football Sweepstakes – Win a $250 Fred Meyer gift card & more! Win a $250 Fred Meyer gift card & more! ENTER SWEEPSTAKES HERE – Hippeas Sweepstakes page. ENTRY LIMIT – You may enter only once and you must fill in the information requested. SWEEPSTAKES ENTRY PERIOD – Sweepstakes Period: Entries will be accepted online starting on or about Jan 02, 2019 at 12:00 AM and ending Jan 25, 2019 at 11:59 PM. PRIZES – The approximate retail value of all prizes is $1850.00. The prizes are: $250 Fred Meyers gift card, one TV of brands’ choice (valued at $500), one Pro-series 22 Pellet Grill, one Roadie 20 Yeti Cooler, HIPPEAS snacks and swag (valued at $100). RULES – See sweepstakes rules here(embedded). Roku Holiday Sweepstakes – Win a Philips 43″ TV! Win a 43″ Philips Roku Tv! ENTER SWEEPSTAKES HERE – Roku Sweepstakes page. ENTRY LIMIT – Each participant is eligible to submit up to one (1) Entry per day during the Promotion Period, for a total of twenty-one (21) entries, regardless of method or combination of methods of entry or number of entries submitted. ELIGIBILITY – The Holiday Sweepstakes (“Promotion”) is open only to natural persons who are legal residents of the United States of America (excluding Rhode Island), who have a valid social security number, and who are at least eighteen (18) years of age at the time of entry. SWEEPSTAKES ENTRY PERIOD – The Promotion Period begins at 9:00 AM Pacific Time (“PT”) on November 30, 2018 and ends at 4:00 PM PT on December 31, 2018. PRIZES – One (1) Grand Prize consisting of one (1) 43” Philips Roku TV (43PFL4662) – Approximate Retail Value of 43” Philips Roku TV: Two Hundred Forty-Eight Dollars ($248.00). Roku TV usage requires creation and activation of Roku account. A Roku account is free. For more information and terms applicable to the Philips Roku TV, please visit: https://www.usa.philips.com/c-p/43PFL4662_F7/roku-tv-4000-series-led-lcd-tv. Allow six (6) to eight (8) weeks for delivery of the Philips Roku TV. Five (5) Runner-up prizes consisting of Roku Premiere — Approximate Retail Value of Roku Premiere: ($39.00). Roku Premiere usage requires creation and activation of Roku account. A Roku account is free. For more information and terms applicable to the Roku Premiere, please visit: https://www.roku.com/products/roku-premiere. Allow six (6) to eight (8) weeks for delivery of the Roku Premiere. WINNER’S LIST – To obtain a list of the names of winners of prizes, mail your request and a self-addressed, stamped envelope, up to sixty (60) days after the close of the Promotion, to The Holiday Sweepstakes WINNERS LIST, c/o Roku, Inc., 150 Winchester Circle, Los Gatos, CA 95033, Attention: Sweeps Dept. 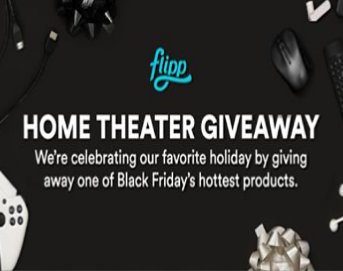 Flipp Black Friday Giveaway – Win a 4K Smart TV & a Walmart gift card! Win a 4K Smart TV & a Walmart gift card! ENTER SWEEPSTAKES HERE – Flipp Sweepstakes page. ENTRY LIMIT – Regardless of the number of responses during the Giveaway Period, each individual is entitled to one (1) entry during the Giveaway Period for entering via the landing page, as well as up to five (5) additional entries by referring friends to the landing page using the custom URL provided who complete their own entry. SWEEPSTAKES ENTRY PERIOD – Giveaway begins on November 9, 2018 at 12:00PM ET and ends on November 22, 2018 at 11:59PM ET (the “Giveaway Period”) with a draw happening on or about November 23, 2018 at 12:00PM ET. PRIZES – Prize is a 4K smart television and Walmart gift card with an approximate cumulative maximum value of $5000. 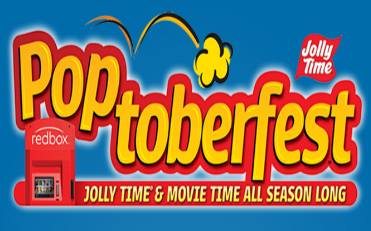 Jolly Time Popcorn Poptoberfest Sweepstakes – Win a 50″ Samsung TV & more! Win a Samsung 50″ TV & more! ENTER SWEEPSTAKES HERE – Jolly Time Popcorn Sweepstakes page. ENTRY LIMIT – Participants may enter ONLY ONCE each day. ELIGIBILITY – This promotion is only open to legal residents of the United States and District of Columbia, except for Florida and New York, who are 18 years of age or older as of the date of entry and has a valid email address. SWEEPSTAKES ENTRY PERIOD – Entries will be accepted online starting on or about October 1, 2016 at 12:01AM CST and ending October 31, 2016 at 11:59PM. PRIZES – Daily Prize Winners (31 total) will receive: Winner’s will receive four (4) – 3 or 4 bag count cartons of JOLLY TIME Microwave Pop Corn each month for twelve (12) months. First shipment will arrive approximately November 15, 2016 and each month thereafter with last shipment in October 2017. Daily winners will also receive fifty-two (52) Redbox® rental promotional codes. Each promotional code is valid for a free 1-night standard definition DVD rental from Redbox. * Suggested retail price (SRP) is $233. Coffee Beanery’s “The Hobbit Movie Giveaway” Facebook Sweepstakes – Win a 32″ Flat Screen HDTV & more! 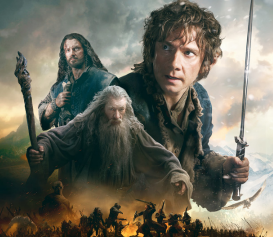 Win a 32 inch Flat Screen HDTV, a Digital Copy of The Hobbit: The Battle of the Five Armies & more! ENTER SWEEPSTAKES HERE – Coffee Beanery Facebook page. ENTRY LIMIT – Entries are limited to one (1) entry per person/household per day regardless of method of entry. ELIGIBILITY – The Promotion is open only to legal residents of the forty-eight (48) contiguous United States and the District of Columbia, who are twenty-one (21) years of age or older (or the age of majority in their jurisdiction, whichever is greater) at the time of entry. SWEEPSTAKES PERIOD – The Coffee Beanery’s “The Hobbit Movie Giveaway” Facebook Sweepstakes commences at 12:00:01 AM Eastern Standard Time (“EST”) on March 3rd, 2015 and ends at 11:59:59 PM EST on March 24, 2015. ShopKo Hi-Def TV Giveaway Sweepstakes – Win a 60″ Vizio Smart HDTV! Win a Vizio 60″ LED HDTV (4 winners)! ENTER SWEEPSTAKES HERE – ShopKo Facebook page. ENTRY LIMIT – Limit one (1) entry per person/e-mail address for each of the timeframes (weekly entry). ELIGIBILITY – Contest open only to legal residents of the United States and 18 years or older. PRIZES – One (1) winner will be chosen per time frame listed above, for a total of four (4) winners. Each winner will receive one (1) Vizio 60” LED Smart HDTV. Approximate retail value of each prize package is $849.99. Winners are responsible for pick-up of prize at their nearest Shopko store location. The “Fall Into Football with Mars & GFS Marketplace” Sweepstakes – Win a Vizio 50″ Smart TV & much more! 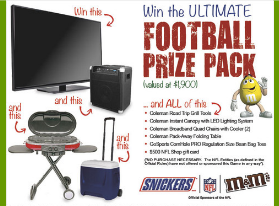 Win a football prize package (includes a Vizio 50″ Smart TV, a $500 NFL Shop gift card & much more)! ENTER SWEEPSTAKES HERE – GFS Marketplace Sweepstakes page. ELIGIBILITY – The “Fall Into Football with Mars & GFS Marketplace” Sweepstakes is open and offered only to legal residents of the 50 United States (including Rhode Island) who have reached the age of majority in their state of residence at the time of entry. 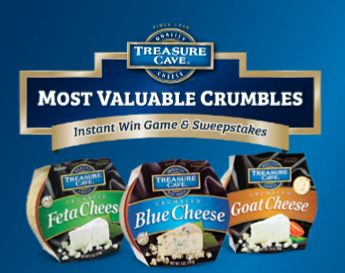 SWEEPSTAKES PERIOD – The Sweepstakes begins at 12:00:01 a.m. Eastern Time (“ET”) on September 1, 2014 and ends at 11:59:59 p.m. ET on September 30, 2014. PRIZES – There will be one (1) Grand Prize and two (2) First Prizes, ten (10) Second Prizes awarded following the conclusion of the Sweepstakes Period. Prize package has an approximate retail value (“ARV”) $1,900.16. Second Prize Winners will receive will receive a $100 NFL Shop Gift Card. VIZIO® Touchdowns For TVS Sweepstakes – Win a 50″ LED Smart TV! Win a Vizio M-Series 50″ Led Smart TV (16 winners)! ENTER SWEEPSTAKES HERE – Vizio Sweepstakes page. December 7th, 14th, 20th and 28th. 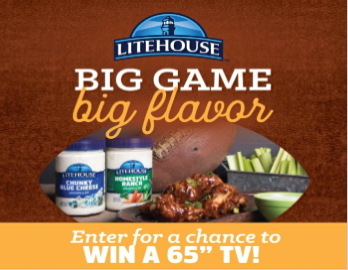 ENTRY LIMIT – There is a limit of one (1) Entry per week before each football game date as listed in Section 1 above, per each person/email address during the Sweepstakes Period. ELIGIBILITY – Participation is open only to living individuals of the fifty (50) States of the United States during the Sweepstakes Period, and are legal residents of the fifty States of the United States and the District of Columbia and who are at least 18 years of age or older (except residents of Alabama and Nebraska who must be 19 years of age or older, and residents of Mississippi who must be 21 years of age or older) as of the commencement of the Sweepstakes Period. SWEEPSTAKES PERIOD – The Sweepstakes commences at 12:00:01 AM Eastern Time (“ET”) on August 29, 2014 and ends at 11:59:59 PM ET on December 27, 2014. PRIZES – One Prize Winner per football game day drawing or an estimated sixteen (16) Prize Winners: the Prize Winners will each receive one (1) VIZIO M-Series 50” Class Full Array LED Smart TV, model number M502i-B1, with an Approximate Retail Value (“ARV”) of $699.99 (the “Prize”). If Steve Johnson scores during the respective football game, the prize will be upgraded to a VIZIO P-Series 50” Class Full Array LED Smart TV, model no. P502ui-B1, with an APR of $999.99. For each time that Steve Johnson scores per game, VIZIO will also donate a VIZIO TV, the VIZIO M-Series 50” Class Full Array LED Smart TV, model no. M322i-B1, to the Boys & Girls Club of American located in the city in which the football game was played.